Professional Development (PD) of teachers is an essential part of the MaxScholar program. Teachers must learn the methods we use and how to use our materials to be able to help their students improve their reading skills. Our PD can be delivered in person or via live webinar. 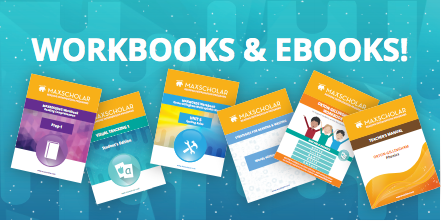 In addition, our workbooks and teacher manuals provide specific directions for each teacher to follow in the use of each program in different teaching environments. We also offer MaxScholar Orton-Gillingham Certification for teachers who complete our specific training programs, as detailed below. *Parents must sign a release for the videos. *Higher level of certification is also available. A minimum of 36 hours of student work on the software (as recorded in our system). A minimum of 48 hours of student work on the software (as recorded in our system). One written lesson plan for Orton-Gillingham phonics (including screenshots or attachments of all materials to be used). An exit exam upon completion of the above requirements. A minimum of 60 hours of student work on the software (as recorded in our system). Two videos demonstrating a complete Orton-Gillingham blended lesson (including all visual, auditory, and tactile drills; as well as sound blending, fluency timing, etc.). One with an individual student, and another with a small group. Two written lesson plans for Orton-Gillingham phonics (including screenshots or attachments of all materials to be used). This certification is available at the end of the first year of using the MaxScholar software and our blended program. A minimum of 72 hours of student contact on the software. Completion of a minimum of 24 hours of practicum work with students in small groups. Five videos of students going through the sequence of steps in the software. Lesson plans developed and submitted to receive feedback on how to use the Orton-Gillingham (O-G) methodology in the classroom or with an individual student. Five videos of the teacher doing an O-G lesson plan (starting with short vowels, and working through multisyllabic words and morphology). This certiﬁcation is available at the end of the second year of using the MaxScholar software and our blended program. Complete two days of PD. Complete a minimum of 20 hours of practicum work with students both on the software and blended model. Five videos of students going through the sequence of steps in the software. Ten additional lesson plans to get mentoring and feedback. Ten videos of students working on the software following the 8 steps lesson plan of MaxReading.